Our Cayman Islands Jet Ski Rental prices are the lowest in the Cayman Islands and - we deliver! Jet Ski along Grand Cayman's famous Seven Mile Beach, North Sound, Stingray City and all of the Cayman Islands most popular jet skiing locations. Our Cayman Islands Jet Ski Tours are the most spectacular and affordable anywhere in the Cayman Islands. Let our professional jet ski tour guides show you the most spectacular sites, many accessible only by jet ski in the Cayman Islands. Experience the absolute best of Stingray City with the intimacy of only 5 jet skis and your guide. Jet ski to Stingray City and play with the stingrays, then jet ski to Rum Point or Kaibo for a beach lunch. Whatever jet ski rental or tour you select, with Moore Marine you are always guaranteed the best jet ski rental prices; the lowest priced and most spectacular jet ski tours; all with the intimacy and security of very small groups and highly experienced guides. Depart from your Georgetown hotel and step aboard an air-conditioned coach for a memorable tour along the West Bay Peninsula of Cayman Island. A brief stop is made at the Governor's Residence, located on Seven Mile Beach and one of the world's most spectacular, before continuing on to visit the world's only green sea turtle farm. Your experienced guides will explain everything - from the tiny hatchlings to the big breeders swimming in their lagoons. You can even pick up a turtle for a photograph. Your next stop is a visit to 'Hell', so named for its unusual rock formations. At sunset when the orange sun reflects off the water collected in the pools, it resembles burning hellfire. This is a favorite stop to mail postcards and have them postmarked from 'Hell'! 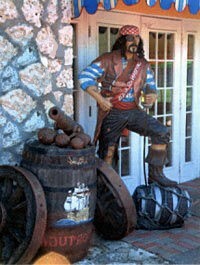 Depart for the Tortuga Rum Shoppe and experience a taste of the Caribbean's original world famous rum cakes and Tortuga duty free liquors. Are you ready for the adventure of a lifetime? 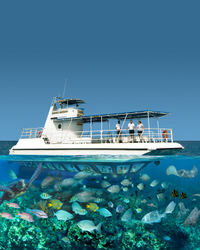 Discover the underwater world of Grand Cayman! Experience the thrill of journeying beneath the sea in a real submarine. A technological marvel, the Atlantis XI Submarine was specifically designed for underwater sightseeing excursions. The spacious cabin is air-conditioned and for your added comfort and maintained at sea level pressure (no effect on the ears). The smooth ride and clarity of the water will amaze you as you explore Grand Cayman's Underwater Marine Park to depths of 100 feet (30 meters). This 40-minute ride is a great way to see what lies beneath the surface without getting wet. After boarding the transfer vessel, your host will give a safety briefing and then you can kick back and relax and enjoy the sights on the 5 minute boat trip to the submarine. Your first sight of the Submarine should be as it breaks the surface, from its previous trip. Once moored alongside, you safely board the deck of the submarine by a ramp and enter the air conditioned cabin through a large hatch. After the hatches are secured, and pre dive checks completed your descent begins. The smooth ride and clarity of the water will amaze you as you explore Grand Cayman's Underwater Marine Park to depths of 100 feet (30 meters). Huge barrel sponges and star corals abound the reef, even the occasional stingray and turtle may pass within a few feet of your large view-port. At the end of your tour, before returning to the dock, you'll be able to watch as the submarine again descends on another excursion, completely disappearing from your sight beneath the surface on its journey to 100 feet (30 meters). See all the highlights of Grand Cayman island on this comprehensive day tour. From the natural beauty of the island�s coast to the historic capital of Georgetown, you�ll see it all on this 6-hour tour. Explore spectacular coral reefs and shipwrecks on the Seaworld Explorer, a state-of-the-art semi-submarine. You'll visit a dramatic shipwreck, the Cali as well as famous Cheeseburger Reef where a diver will feed the many varieties of fish right in front of your window. As your captain maneuvers the Observatory to various locations, you'll view abundance of marine life and even a historic shipwreck, through large windows. Throughout your tour, a guide will provide an informative yet entertaining narration, in an interactive setting while answering any questions you may have. The first site you visit is a dramatic shipwreck, the Cali, a steel schooner built in 1900. This ship ran aground 100 yards (90 meters) off the coast of Grand Cayman in 1944. From here, your captain takes you to Cheeseburger Reef. Be sure to have your cameras ready when our diver enters the water and begins to feed the hundreds of multi-colored tropical fish right in front of your window. Hear more tales of the high seas as the Seaworld Explorer takes you to see the wreck of the Balboa. The Balboa is a 375 foot (115 meter) freighter which traveled from Cayman to Cuba when she encountered one of the worst hurricanes in the island's history on 10 November, 1932. The ship was literally broken into pieces as she was bounced along the ocean floor by huge waves. Much of her cargo of wood was used to reconstruct the buildings seen in George Town today. The Seaworld Explorer then brings you back to the dock in the heart of George Town where you'll disembark. Departure Time: Tour departs in the morning and afternoon. Please call upon arrival in Georgetown for exact departure times. Escape the bustle of Georgetown and join a friendly and knowledgeable tour guide for a ride through quaint colonial Bodden Town, Cayman's first capital, on your way to the Q.E.II Botanic Park. The Botanic Park is a unique blend of natural beauty, culture and history. Phase I is dedicated to showcasing Cayman's native flora. Phase II combines the simple elegance of a traditional Caymanian garden with the startling beauty of an exotic floral display. Come and fall in love with Cayman's nature, history and beauty. Enjoy a leisurely walk through colorful gardens, botanic display and lake and nature displays. Stroll through Heritage Garden, enjoy the Tea House and its panoramic views and the lake area which forms a natural habitat for the Cayman Blue Iguana and breeding ground for a variety of aquatic birds and animals. Departure Point: Tour departs from your Georgetown hotel or the cruise ship port. Depart from your hotel or condo for Conch Shell House. A historical dwelling constructed of Conch Shells. Depart the Conch Shell House for Pedro St James Great House - a national historic site where Caymanians met in 1831 to introduce democracy to the islands. Pedro St James offers a window into times past. A visitor center featuring a multi-media production resource center and gift shop, will compliment your tour through the castle and its gardens. Depart Pedro St James for the Stingray Brewery and experience a taste of Cayman's original beer before returning to your hotel.